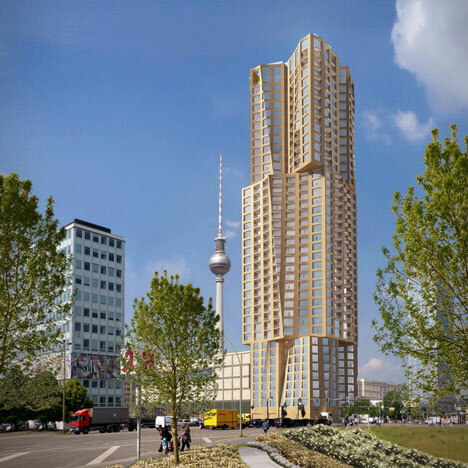 News: architect Frank Gehry has won a competition to design a skyscraper for Berlin that is set to become the city's tallest building. Gehry Partners saw off competition from eight other shortlisted firms, including Adjaye Associates and David Chipperfield Architects, to land the commission to design the 150-metre residential tower for international real estate firm Hines. Proposed for a site between Hackescher Markt, Friedrichshain and Berlin-Mitte, the building is conceived as a cluster of distorted cuboids that have been rotated away from one another to relate to some of the city's main focal points, particularly the nearby Karl-Marx-Allee. Three hundred apartments and a hotel will be located within the building, while the exterior will be clad with stone. "Gehry's design is strong in visual expression and introduces an unusually eccentric, new pattern for this location. Nevertheless, the facade radiates agreeable tranquility," commented Regula Lüscher, director of the city's urban development department and one of the competition judges. "The design blends well with the neighbourhood and conveys all aspects of metropolitan living," she added. This will be the third time that Gehry has collaborated with Hines. The firm was his client for the DZ Bank in Berlin and acted as development manager for his New World Center in Miami Beach. "The quality of the designs submitted was extremely high and reflected the importance of this prominent location in the centre of Berlin," commented Christoph Reschke, one of Hines' managing directors. "This place has a strong symbolic character and will develop into a metropolitan residential and retail area. In order to transform the square, we want to take a chance on something new and exceptional," he said.